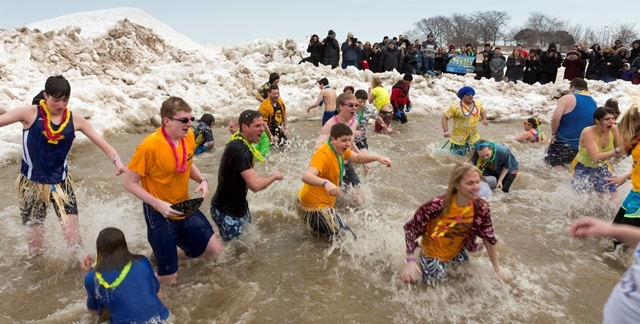 More than 315 warm-hearted souls braved the icy waters of Lake Michigan in Evanston on Feb. 21 at the Evanston Polar Plunge at Northwestern University, which raised more than $87,000. The Lyons Township High School first heard about the Polar Plunge three years ago. What started as a few people participating has developed into the top fundraising school team and the team with the most money raised overall at the 2015 Evanston Polar Plunge. Their first year, Lyons Township High School brought a small group out, mostly teachers and a handful of aviation students and Best Buddy Club members. This year, 20 students and 9 adults from Lyons Township High School took the Plunge and, with additional fundraising team members, brought in just over $11,000 for the event. “If jumping into some cold water helps raise some money and awareness for such an inspiring organization, we are more than happy to do it!” explains Dave Root, an aeronautics teacher at Lyons Township High School. The funds raised from the Law Enforcement Torch Run Polar Plunge® will help Special Olympics Illinois Near West Suburban/Area 5 which serves athletes with intellectual disabilities in Western DuPage and the suburbs in Cook County located to the west and north of Chicago. Lyons Township High School also participated in the 2014 for the Law Enforcement Torch Run Plane Pull. “This was our first year competing (in the Plane Pull) and we are hoping to make it an annual tradition with hopes of bringing two teams out next year,” said Root. Other Evanston Plunge teams and individuals were recognized for their accomplishments, including the NEDSRA Huskies for best costume and Angelo Russo who raised $2,750. Special Olympics Illinois would like to thank the statewide presenting Polar Plunge sponsor GEICO as well as the Evanston Polar Plunge sponsors: Elmer’s Watersports, Prairie Moon, RedEye, Comcast SportsNet and Skinny Pop. The public can still make donations to Polar Plungers by visiting www.plungeillinois.com and clicking on the “Support a Plunger” button.